While the MiG-15 was a world beater, it suffered somewhat from a lack of power. In hopes of using the same basic design for a faster plane, the fuselage was stretched, the wing swept back a bit more and an afterburner added. What they ended up with was a faster MiG-15, but not the world beater the had hoped for. Still, it was rugged and reliable and able to be maintained without a lot of fancy equipment. Perfect for Soviet conditions and their client states. A bit too late to see action in Korea, it was able to see a lot of it in the Mid-East, Vietnam and a number of other places around the world. Though the MiG-17 was not difficult to fly, it was an aircraft that had several vices and so the pilot had to be on his toes. This was especially true in combat where it had a tendency to snap spin without too much warning. In the hands of an experienced pilot, this could be used to his advantage, but most who flew this plane in combat were lacking in initiative and in combat training. Thanks to the end of the cold war, some of the MiG-17s that have been pulled from service were able to be purchased by warbird fanatics and provide a spirited display at various air shows. 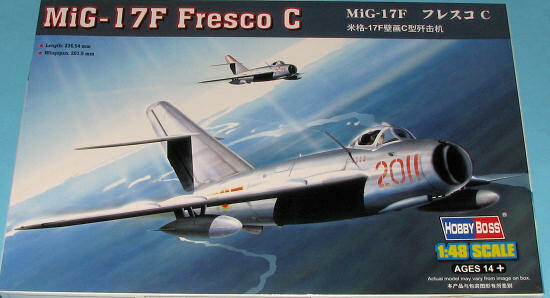 The MiG-17 is one of my favorite aircraft, though I really don't build as many models of them as I should. In 1/48, both SMER and Hobbycraft have produced models in the past. The SMER kit by all accounts is quite nice, but has some fit issues. The Hobbycraft version is less expensive, but some have mentioned that there are some shape issues in the wing sweep among others. I am not a 'pull out the micrometer and the plans' sort of person. I can only tell you that when you are done with those kits, no one will mistake it for anything other than a MiG-17. Now we have another one to add to the batch. This kit from Hobby Boss does not have a zillion rivets all over it. In fact, it is really quite well done with fasteners only where they are prominent on the real aircraft. I've shown a scan of the lower wing so you can judge for yourself. From what I can see, an early MiG-17 is in the works along with probably a Lim-6 as this current boxing includes rocket pods and inner pylons, something more often seen with a Lim-6. Unfortunately, it seems that Hobby Boss wants you to put them on all your builds as they have opened every optional hole there is and says nothing about filling them if not used. Personally, I wish they'd leave opening optional holes to the modeler. In the image below, I have no clue as to what the four holes on the far right are for, but they do need to be filled. 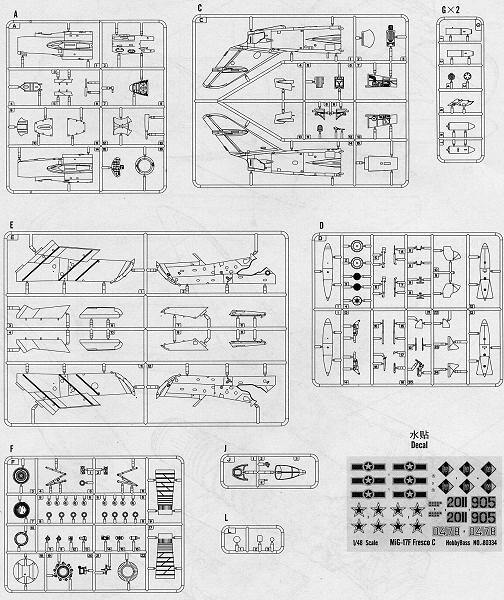 Like the Tamiya MiG-15, the folks at Hobby Boss have decided we need an engine so one full sprue is dedicated to that engine. You pretty much have to install at least the main part of it so that you'll have an afterburner section to stick out the rear. Means a lot of nose weight with not a lot of space in which to put it. The kit's cockpit is well done with a passable bang seat and detailing on the cockpit side wall pieces. There is even detail in the electronics bay above the nose intake with a separate cover. Detail on the wings is very good. the ailerons are separate and have a curved forward section so that you can position them in something other than the neutral position. Separate lower flaps are also given. The wheel wells have good detailing in them as do the gear and wheels. The main wheels have separate inserts to help in painting. Speed brakes can be built in the full open position if you wish. For things under wings, you have drop tanks and inner weapons pylons for either bombs or rockets. 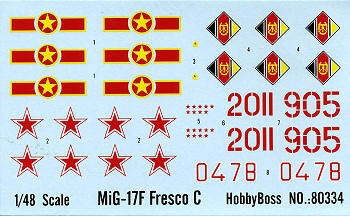 These would be more appropriate for the East German markings option as this was not standard on the majority of MiG-17s. The canopy and windscreen are separate so you can pose the canopy open. Instructions are quite well done with large, crisply drawn illustrations. Colors are provided in generic and Gunze references. Many will need to be mixed. Inside doors is shown to be a mix of gold and silver but no ratio is provided. No information on the colors of wheel wells is included either. Markings are for three planes. One is the VPAF aircraft on the box art. Another is a generic Soviet aircraft with Bort0478 and red stars. Both of those are in unpainted metal and it would not be incorrect to have these rather weathered. The third is an East German aircraft in brown/green uppers with light blue undersides. The decals are quite nicely printed and in my experience, should provide no problems. If you don't like the options there have been a number of aftermarket sheets printed for this plane. So there you have it. Another MiG-17 and one which looks quite nice. 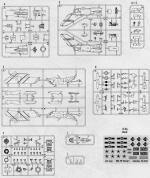 The layout of the sprues is such that I'd bet some of these could be used for a MiG-15 kit. A bit pricey for some at nearly $40, but you can get it at discount if you look. As a closing comment, I don't know how accurate this one is but it sure looks good. It may have problems and it may not. That can be left up to those who know more about it than I. Thanks to me and store credit for getting this one for you to inspect.